Keep your sport shoes and sneakers clean and protected to extend their life, and get the most use you can out of them. We carry a wide range of Kiwi Sport Shoe and Sneaker Cleaners and Rain and Stain Protectors, as well as Insoles to provide comfort. Also, check out our selection of Odor Protectors to keep your shoes and sneakers smelling fresh. Ultra Spring Laces are shoe laces you don't have to tie. Perfect for kids, adults who suffer from arthritis or stiff hand joints, as well as fashion conscious people who are looking for a fun, new look. The lace is coiled to hold the desired tension. Simply lace the shoes while they are on your feet, and you are ready to go. No bending over to tie your shoes, or re-tying shoes that come untied. Machine washable. One pair per package. Available in Black and White. Sneaker Balls shoe fresheners tackle the odors inside sneakers, gym bags, lockers, or anywhere the toughest, ugliest smells hang out. Each ball contains a fresh, clean scent and an odor blocker formulated to counteract the unpleasant odors caused by perspiration. Scent lasts for three months. Sneaker Balls also work in cars, clothes hampers, drawers, diaper bags, suitcases, or anywhere odors are a problem. 1 pair. Available in a variety of styles and colors. Griffin Sport Shoe Cleaner - 2.5 oz. Griffin Sport Shoe Cleaner deep cleans sneakers and sport shoes. Removes dirt and grass stains. Good for all smooth leather, vinyl, nylon and fabric sport shoes. Not for use on suede or nubuck. Built-in bristle cap makes it easy and mess-free to apply and use. Made in USA. Fiebing's Fresh Feet - 4 oz. Griffin Sneaker Allwhite - 2.5 oz. Fiebing's Fresh Feet eliminates offensive footwear odors. Simply spray inside shoes, boots, or sneakers. Also great for lockers and gym bags. Griffin Sneaker Allwhite returns color to worn out white sneakers. Sponge applicator top makes it easy to apply, and mess-free. Made in USA. Kiwi Fresh Force Shoe Freshener - 2.2 oz. Tarrago Super White - 2.5 oz. Kiwi Fresh Force Shoe Freshener controls shoe and sneaker odor. The unique, upside down applicator gives a fresh blast of deodorant from heel to toe, providing all day shoe freshness. Fast acting, works on contact. Powder fresh scent. Easy and convenient to use. Safe for use on all types of footwear. Can also be used in gym lockers and sports bags to control odor. Tarrago Super White whitens leather, synthetic leather and canvas shoes and sneakers. Works on textiles, also. Built-in sponge applicator makes it easy to apply. Once dry, the product does not stain. Clear Penguin Shoe Goo adhesive and sealant provides permanent repair for all leather, vinyl, rubber and canvas shoes, boots and sneakers. Secures loose soles, repairs damaged heels, and coats frayed shoelaces. Revives worn shoes. It dries to a waterproof, flexible rubber. Use it to fix waders and boots without breaking or cracking under stress. Can be used on flip-flops, cowboy boots, dress shoes, all sports shoes, flippers and much more. 3.7 oz. Available in Black. Easy, Easy, Easy!!! No drip applicator top. No rinsing!! Simply depress applicator top, apply to article, rub in a light motion, wipe dry! Ideal for quick touch ups anywhere!! Perfect for athletic shoes. Gentle enough for daily use. M&B Odor Stop refreshes and deodorizes all shoes. Odor Stop may also be used to deodorize gym bags, golf bags, and other areas where moistures and perspiration persists. M&B's Cool Mountain Mist formula will keep your shoes and bags smelling fresh and clean. Kiwi Select Sport Fast-Acting Cleaner - 7 oz. Moneysworth & Best Salt Stain Remover - 6 oz. Kiwi Shoe Shampoo - 8.7 oz. Kiwi Select Sport Fast-Acting Cleaner sprays on sport shoes and wipes clean. No mess, no fuss. Ideal for athletic leather shoes, as well as nylon and vinyl uppers. No rinsing, no messy residues. New Ride Force Fields Toe Box De-Creasers protect sneakers from creasing and wear. Can be used in shoes, sneakers and boots to keep them looking new. The patented design fits perfectly into the toe box so shoes keep their shape. Self-adhesive, so they are easy to apply, simply remove backing and slide into shoe. 1 pair per box. Available in Small, Medium and Large. Small fits children's 4-7 and women's 5-10 shoes. Medium fits women's 10 1/2 - 12 and men's 8-11 shoes. Large fits men's 11-1/2 and up. Shoe & Sneaker Sweetner + eliminates odors on multiple surfaces such as shoes, skates, gym bags, lockers, sports equipment and more. Saphir White Novelys is a highly opaque white shoe cream with integrated foam applicator, developed especially to get sneakers white again. Suited for white leather, textiles and shoes of synthetic materials. Spenco PolySorb Cross Trainer Replacement Insoles provide maximum cushioning for your feet from heel to toe. Contoured heel cup and arch support, cushions and supports your feet. Special forefoot cushion provides extra protection and cushioning for the ball of foot during aerobics, racquet and court sports. Special heel strike cushion provides maximum cushioning at heel strike when walking, running and jogging. Low-friction fabric helps reduce blisters and calluses. Odor control. Improve your performance with these durable and washable insoles. 1 pair. Available in men's and women's sizes. Spenco PolySorb Walker/Runner Insoles. Contoured heel cup and arch support cushions and supports your feet. Special heel strike provides maximum cushioning at heel strike when walking, running and jogging. Absorbs shock and supports the arch and heel. Helps reduce friction and heat build-up that cause blisters and calluses. 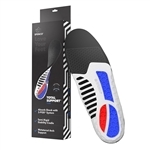 These durable and washable insoles prolong the life of your shoes. 1 pair. Available in men's and women's sizes. All the features of our Total Support® Original insole but with a stiffer, more rigid arch support and SpenCore® Layer forefoot pad. Perfect for serious athletes needing stiffer, more rigid support. Total Support® technology aids in the relief of symptoms caused by pantar fasciitis. All the features of our Total Support® Original in a thinner, ultra-light insole. TPR Gel air grid pods and forefoot pad. Perfect for low-volume or minimal running shoes.